Deluxe jaw and trigger reaching aides available in a variety of sizes both standard and folding. These reaching aides assist individuals with limited reach and hand strength. Units have magnetic tip to help retrieve objects. Drag lug helps position product for easy pick-up. Open jaw closes when trigger is squeezed. 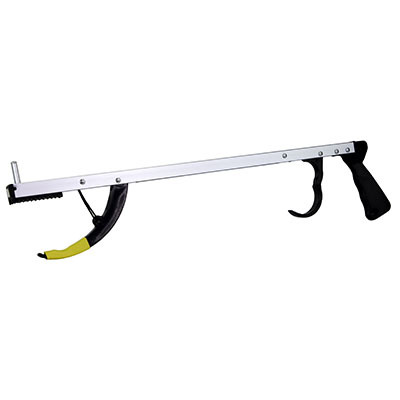 Deluxe jaw and trigger reaching aides assist individuals with limited reach and hand strength. Units have magnetic tip to help retrieve objects. Drag lug helps position product for easy pick-up. Open jaw closes when trigger is squeezed. Dimensions: 20" x 0.5" x 5"
Dimensions: 26" x 0.5" x 5"
Dimensions: 32" x 0.5" x 5"
Deluxe jaw and trigger reaching aides fold for convenient storage and transportation. 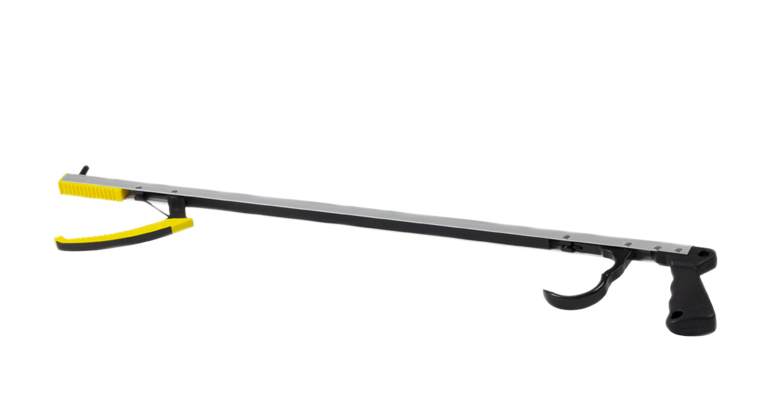 The reacher assists individuals with limited reach and hand strength. Units have magnetic tip to help retrieve objects. Drag lug helps position product for easy pick-up. Open jaw closes when trigger is squeezed.